Outdoor theatre returns to the shores of Coniston when Illyria brings its summer programme to the Lake District. The ever-popular touring company arrive back at Brantwood in July with The Tempest. 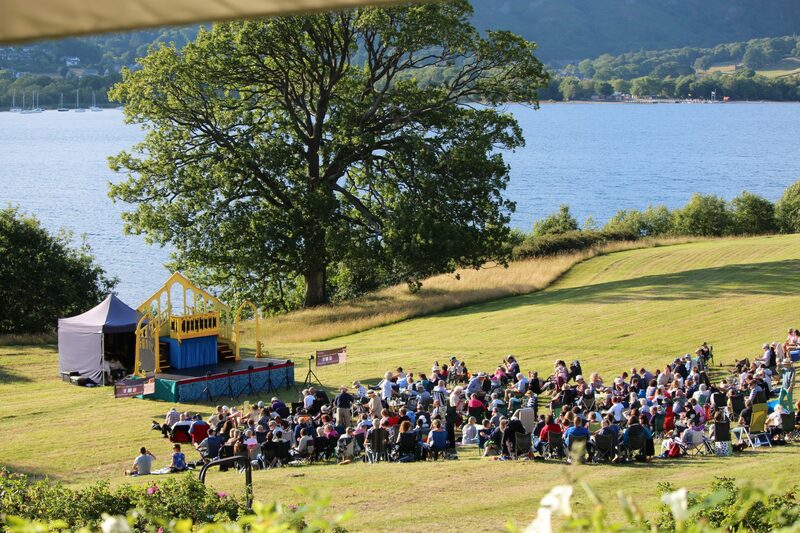 Tickets are now on sale for our annual outdoor theatre shows, which take place in our scenic lakeside meadow overlooking Coniston Water to the fells beyond, providing a spectacular back-drop for Illyria’s stage. Please bring your own seating. Gates open at 6pm with the shows starting at 7pm. Adults £12.00 Children & students £8.50. Coniston Launch will be running a return ferry service to and from the performance, leaving Coniston boat landings at 6.15pm and returning after the performance. Adults £3, children £1.50. Ferry must be booked in advance through Brantwood. Performances will go ahead whatever the weather so come prepared. The Terrace Coffee House and Restaurant will be open for food and refreshments until the performance starts as well as during the interval. Shakespeare’s final play, is also believed by many to be his finest comedy, presented in Illyria’s slick, physical and imaginative style. A magician marooned on an island with his daughter conjures up a storm to shipwreck his enemies on the shore of the island. Which is greater – his desire for revenge or his aptitude for forgiveness? One of Illyria’s funniest and most popular ever family shows, last performed in 2003, is taken from the One Thousand and One Nights (otherwise known as the Arabian Nights). Young Ali Baba stumbles across an enchanted cave when he overhears the magic words that open it: “Open Sesame!” Inside the cave he finds and steals untold amounts of gold and jewels. But what will he do when the Robber King comes looking for revenge? The show is notable for the most riotously funny scene Illyria has created in its 28 year history, where one character polishes off all the thieves – yes, all 40, and you get to count each one!